It’s no secret we love hot chips. Baked, deep fried, hand cut, from a packet, sweet potato, zucchini or halloumi – put it in fry form and you’ve sold us. But what makes the BEST chips? Crunch, oil, seasoning? We’re no food scientists, but we’ve definitely eaten our fair share of chippies, just so we can bring you the best of Brisbane. 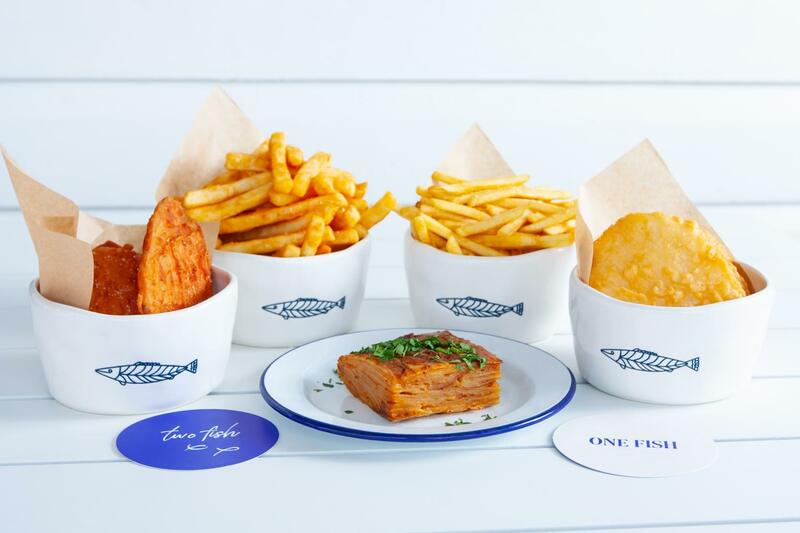 They’ve only been splashing around since this year, but gourmet fish ’n’ chippery One Fish Two Fish are proving they can swim with the big boys. Their dedicated potato menu (you heard right) is a shining beacon of hope, with crisp shoestring fries, beer battered chips, potato scallops (both regular and of the sweet variety) and even potato bake shaking things up. Seasoning-wise, choose from sea salt, chicken salt, vinegar salt of cajun gun powder for an extra kick. Whether you’re a purist who likes fat and crunchy bourbon fries with aioli, or consider yourself a healthy carb connoisseur who prefers sweet potato with tahini sauce, there’s a chip with your name on it at West End’s OG beer bar. Pair those salty boys with a veggie burger and wash it down with a beer from one of their 26 taps. Arriving on the scene hot and fresh from the kitchen, Fish Lane’s latest addition seems all too appropriate. Boasting some fancy fish ’n’ chippies, the spuds from Ol’ School are hand cut, fresh AF and some of the tastiest morsels we’ve ever consumed. Served the way the Good Lord intended them, hot ’n’ salty on brown paper with vinegar and hot sauce, grab a bottled cocktail and sail into Flavourtown – sup Guy Fieri? Feeling extra? Feeling SAUCY? The team at Big Roddy’s are feeling it ALL, so they’ve loaded up their signature hand cut fries with red kidney bean chilli and homemade cheddar sauce, or go full Canadian with rich gravy and cheese curd (poutine PLEASE). For those feeling a little less rich, there’s always sweet potato fries – just don’t forget the cheeseburger sauce! So Frenchy, so chic, Fritzenburger are bringing fresh, fresh frites to Caxton Street. Keep it simple and season at the Fritzensalt station, or go out with loaded frites. Cheese sauce, candied bacon, green onion, Fritzensauce and twisty salt – there’s no debating they’re Fritzing good! Hot and dangerous, Billykart don’t want no truffle – but they’re certainly not shy with their truffle oil! Stuff your face with piping hot fries, loaded with parmesan and truffle oil or keep it salty and simple. You’ll have to kart us out of here! Hot, crunchy, herby chips, smothered in crumbled feta. Does it get better? It does when they’re stacked and rolled up in a soft pita with tender lamb, smothered with tzatziki and hummus.